When it comes to food preference predictability, I’m pretty easy to get to know. I like heat, but more than heat, I like creamy textures and bright notes that balance sweet and sour flavors. 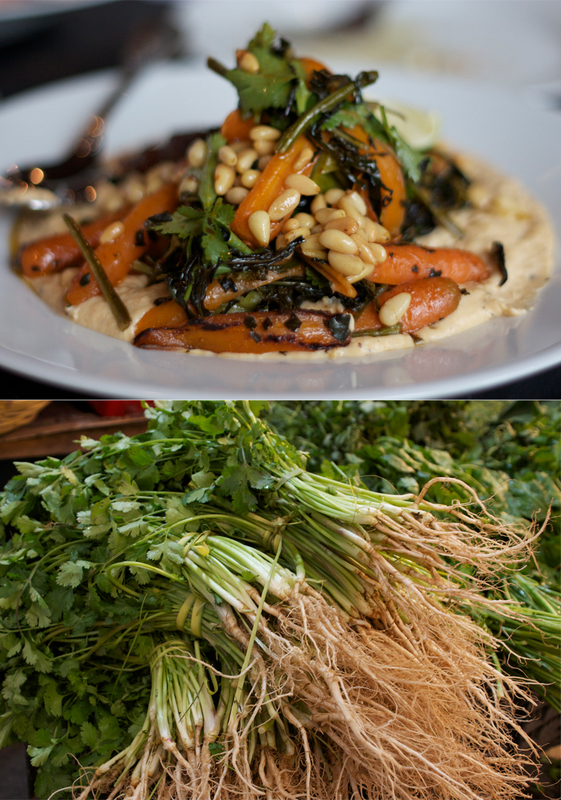 This dish takes sweet roasted carrots to a new level by incorporating a member of the same family (apiaceae), fresh-tasting cilantro, a dash of lemon juice, a smidge of harissa, pine nuts and the creamiest hummus imaginable. HELLO. MY NAME IS SHARBANI AND HUMMUS SAVED MY LIFE. Moving on from my love of cilantro, let’s talk about hummus. No, it’s not made of magic, but it might as well be. Hummus has helped me through college, breakups, and life–and out of plenty of awkward conversations. Ok, so it hasn’t technically saved my life, but emotionally, maybe. I fear that I learned too late in life that not all hummus is the same. The first time I had freshly, homemade hummus at a Middle Eastern friend’s house, I felt I had been duped by all previous hummus in my life. It was so creamy, so perfect. But I couldn’t seem to shake loose any secrets from apparent experts over the years to come. Yes, so the delicious picture on top. The sliced carrots were tossed in olive oil and salt, then roasted at 425 degrees Fahrenheit for 15-20 min and finished with lemon juice. They were then piled on top of the hummus (mixed with some spicy harissa) with sauteed bitter, leafy greens, then sprinkled with toasted pine nuts and cilantro. The night before, put the chickpeas in a large bowl and cover them with cold water at least twice their volume. Leave to soak overnight. The next day, drain the chickpeas. Place a medium saucepan over high heat and add the drained chickpeas and baking soda. Cook for about 3 minutes, stirring constantly. Add the water and bring to a boil. Cook, skimming off any foam and any skins that float to the surface. The chickpeas will need to cook between 20 and 40 minutes, depending on the type and freshness, sometimes even longer. Once done, they should be very tender, breaking up easily when pressed between your thumb and finger, almost but not quite mushy. Drain the chickpeas. You should have roughly 3 2/3 cups/600 g now. Place the chickpeas in a food processor and process until you get a stiff paste. Then, with the machine still running, add the tahini paste, lemon juice, garlic, and 1 1/2 teaspoons salt. Finally, slowly drizzle in the iced water and allow it to mix for about 5 minutes, until you get a very smooth and creamy paste. Transfer the hummus to a bowl, cover the surface with plastic wrap, and let it rest for at least 30 minutes. If not using straightaway, refrigerate until needed. Make sure to take it out of the fridge at least 30 minutes before serving.